2016 Ford F-350 Super Duty For Sale In Vernon, Kelowna, Okanagan, BC. The Ford F-series of pick-up trucks has always been the most popular truck on the road, and while the F-150 is a great truck, sometimes you need a truck with a lot more power. The big brother of the bunch, the 2016 Ford F-350 Super Duty provides incredible towing and hauling ability, while keeping the comfort and technology of its smaller relatives. 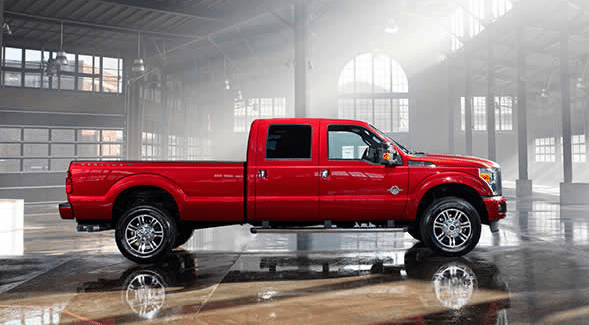 The F-350 Super Duty comes in five different trims: XL, XLT, Lariat, King Ranch, and Platinum. 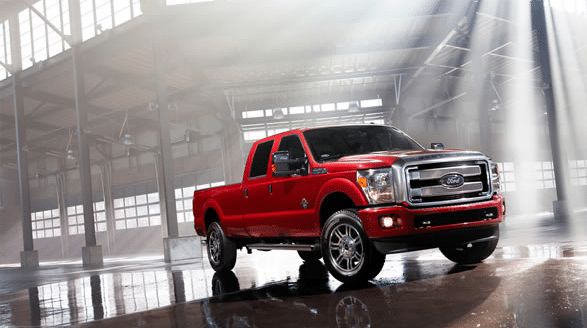 From the outside, the 2016 Ford F-350 Super Duty is big and brawny. Up front, the fascia features broad, horizontal lines, making it look even taller than it is. This includes horizontal bars underneath the trademark Ford blue oval, along with a grille surround in chrome, black, or body colour. Dual-beam jewel-effect halogen headlamps sit on each side, in tall, front-facing assemblies, helping to create an imposing, muscular front end. This theme continues as you move towards the back with tall, flat sides and masculine lines – having available dual wheels in the rear just heightens this sense. Select either the 6’4” or 8’ box for your hauling needs. These beds can be protected from abuse using either an available drop-in bedliner or the Tough-Bed spray-in bedliner, which includes a tailgate guard and black bed bolts. They can also be extended using an available bed extender. Cab steps are available in either black moulding or chrome, to make getting in and out a bit easier. At the back, tailgate steps do the same for getting in and out of the bed. Trucks with the Platinum trim receive a luxury-themed exterior, including special trims, badging, and unique colour schemes. King Ranch trucks have similar changes, although done with a Western theme and imaging instead. 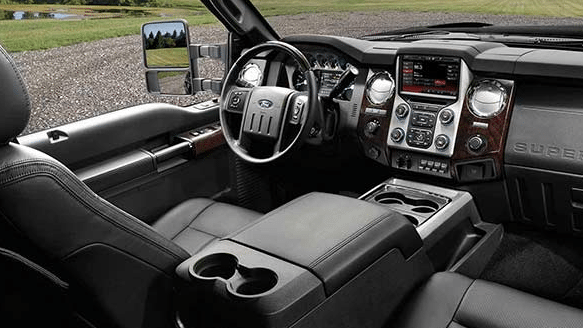 Inside, the 2016 Ford F-350 Super Duty has seating for anywhere from two to six passengers, depending on the cab chosen and whether the front seat is a full bench or two seats plus a console. Options include Regular Cab, Super Cab and Crew Cab. Upholstery choices available include easy-clean vinyl for vehicles meant for worksite use, premium cloth, and luxurious high-grade leather. There’s plenty of space in the cabin for passengers as well with ample head room, hip and shoulder room in all seats. King Ranch and Platinum trims get unique seat stitching, materials, color choices and trim material inside, matching the themes found on the exterior. At the top of the centre console is the infotainment system, running from the base audio system that is part of the Ford SYNC system, up to the MyFord Touch advanced connectivity system. This system features multiple USB ports and an SD card reader, connected to an 8-inch colour LCD touch screen. These can also be controlled through voice activation, along with steering wheel-mounted controls, so you don’t have to take your attention off of the road. Optional remote start combined with heated seats and a heated leather-wrapped steering wheel makes the winter a little more bearable. With chassis rigidity and strength, the 2016 Ford F-350 Super Duty is able to haul a massive payload and exceptional towing. Both rear- and four-wheel drive is available, and four-wheel drive can be complemented by the FX4 Off-Road Package for serious off-roading needs. This package includes multiple skid plates to protect vulnerable areas, plus a transfer case and off-road shocks. Two engines are paired with the TorqShift 6-speed SelectShift automatic transmission. Active and passive safety features keep the 2016 Ford F-350 Super Duty a safe place. Ford backs the 2016 Ford F-350 Super Duty with a number of warranties. 2016 Ford F-350 Super Duty For Sale In Vernon, Kelowna, Okanagan Valley, B.C. For the best hauling and towing capabilities, for work or play, the 2016 Ford F-350 Super Duty has incredible capabilities. It also shows that you don’t need to sacrifice comfort or technology to have those abilities – the F-350 can easily handle long-distance duties, like camping or hauling horses. This is one truck that has everything you need for spending time outdoors. Experience everything the 2016 Ford F-350 Super Duty has to offer at your local Okanagan Ford Dealer - Watkin Motors Ford. Take it for a test drive through the city streets or out on the highway to find out what it can do. Watkin Motors Ford wants to match you with a Ford vehicle that fits your needs.